What do you get a new born baby that wants to rule the world? The Waldo Pancake Super Baby gift set of course. 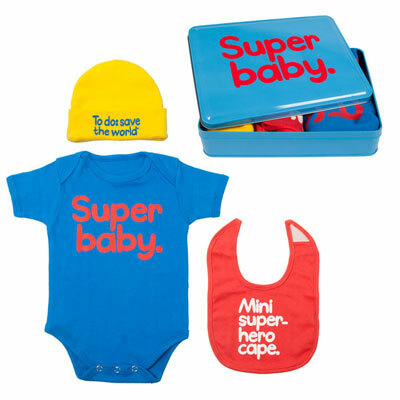 Designed for 0-6 months, the coloured ‘Super Baby’ tin opens to reveal a 100% cotton baby grow, hat and bib each adorned with some Waldo Pancake wit, namely Super baby’ on the baby grow, ‘Mini super hero cape’ on the bib and ‘To do: save the world’ on the hat. All of that for a rather reasonable £13.